Local police were called on Sen. Jeff Merkley, an Oregon Democrat, on Sunday as he tried to enter a shelter for undocumented children during a trip to the Texas border — a trip the lawmaker said he took to learn how the Trump administration is implementing its policy of separating children from their parents. During his visit to Brownsville, Texas, Merkley walked up to a former Walmart store that had been converted into a facility run by a nonprofit called Southwest Key, which contracts with the Health and Human Services Office of Refugee Resettlement to take care of undocumented children once they arrive in the United States. They are kept there until their next stop, typically to family members inside the United States or in their home country, or foster care. Merkley’s office had notified reporters in advance that he was going to visit the border to try to get access to facilities where children were being housed. ABC was among several news organizations that sent a camera to cover his trip. Merkley tried several times to get the facility’s supervisor to come out and talk to him, saying that he and the reporters who were with him deserved to see the inside of the shelter to see how the U.S. government was treating children in its care. Sen. Jeff Merkley arrives in the Capitol for the Senate Democrats' policy lunch, May 15, 2018, in Washington, DC. “They do not want members of Congress to see what's going on inside. They do not want the public to see what's going on inside,” he said as he waited, speaking to several reporters as well as his staffer who was streaming the visit live on Facebook. He said his staff had called the Southwest Key Casa Padre facility late last week to arrange a tour, but when he arrived it appeared no one was expecting him. “They should be able to offer a tour, not have it be some sanitized, Potemkin village where they arrange everything to look very nice when you arrive,” Merkley said. Merkley was not arrested, but he, his staffer and a small retinue of journalists were asked to leave the premises. The shelter’s supervisor would not talk to Merkley other than to refer him to the Health and Human Services public affairs office in Washington, D.C.
Merkley had organized his last-minute trip as a way to bring awareness to the Department of Homeland Security’s new enforcement policy of referring 100% of illegal immigration cases for prosecution, including immigrants who crossed the border seeking asylum. DHS is also now not reuniting parents with their children once the parents have completed their preliminary court proceedings, citing legal precedent that prevents the government from holding children for more than 20 days. “If you don’t want your child separated, then don’t bring them across the border illegally,” Attorney General Jeff Sessions said in announcing the new enforcement policy. “United States Senator Jeff Merkley ... along with five other individuals, attempted to enter an unaccompanied alien children’s (UAC) shelter unannounced and broadcast live via social media last night in Texas. Thankfully for the safety, security and dignity of the children being cared for there, they were denied access. The Department of Health and Human Services takes the legal mandate to care for these children seriously. No one who arrives unannounced at one of our shelters demanding access to the children in our care will be permitted, even those claiming to be U.S. Senators." In another statement, a DHS press secretary said the department was simply following the laws passed by Congress and that the safety of children is “paramount” for the agency. 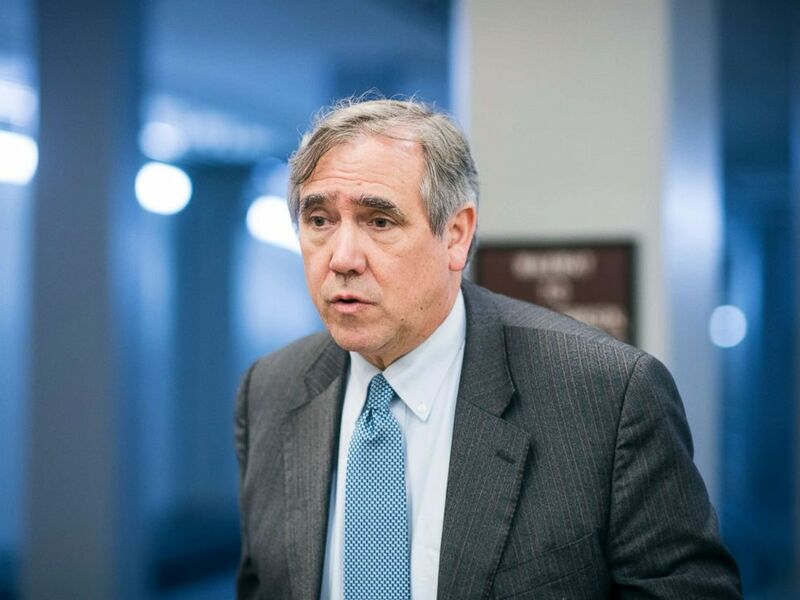 “I encourage Senator Merkley to work with the administration to fix the underlying loopholes that act as a pull factor for illegal immigration and place these children at risk from smugglers and human traffickers,” the spokesman said. While DHS was not involved in Merkley's stop at the children's shelter, it did organize a visit earlier that day to a nearby processing center for children and adults, which they said they facilitated on short notice "despite the obvious and serious privacy concerns." The American Civil Liberties Union, which filed a class action case in March challenging the policy, has said it is aware of at least 700 cases of parents being separated from children as of May. The official policy was announced earlier that month but aid groups like the Florence Project said they saw an uptick in family separation cases last summer. While there have been plenty of anecdotal cases reflecting the policy, its implementation is harder to track in a systematic way. Before he visited the children’s shelter, Merkley stopped by the nearby processing center. He was allowed inside but the journalists accompanying him were not. When he emerged, he said he had only been allowed to talk to one father-and-son pair who had been already been reunited and were awaiting release, whereupon they would stay with family in New Jersey until the father’s court case. He added that the father had an ankle bracelet which officials would use to monitor him until his return. He said the officials told him families were typically only being separated for a short amount of time, although anecdotes from detained parents tell a different story. Jocelyn, a mother fleeing an abusive husband in Brazil, told ABC’s Tom Llamas that she had been jailed in El Paso, Texas during her court proceedings while her 14-year-old son was sent to a facility in Chicago. Now living in a shelter, Jocelyn has not seen her son for eight months. “I don't feel like I'm getting the real story yet of all that's going on with this new policy and its impact on families seeking asylum,” Merkley said after he emerged from the processing facility. Merkley also visited a humanitarian respite center, being run by the Catholic Church in the area, where undocumented people can go once they are released from U.S. custody. He spoke through a translator with a man who would not show his face but who was at the respite center with his two children and his daughter. Merkley told the man that he was there to learn more about why some families were being separated as the adults awaited adjudication. “That's what worries me; we don't want to be separated,” the man told him.